As the sun rises announcing a new day to face, the screen door slams as her night guest slips out. Crushing the cigarette into the ashtray and shoving the now empty whiskey glasses aside, the woman shoves her chair back from the table in disgust. She glances around the garbage strewn kitchen and her eyes fill with tears. Taking a deep breath she walks out to the old shed where her pottery tools lie covered in dust. The kiln sits in the corner with old rags piled high on it’s lid. Her work table has clumps of dried clay stuck to wood. Her potters wheel has cob webs intriguingly stretched across it. Walking to the shelf she grabs a whisk broom and begins sweeping the cob webs with a vengeance while muttering to herself. She grabs a hand full of rags and furiously dusts off the work table, scraping at the old dried clay. Once the cob webs are gone, the dust removed, and the rags put on the shelf, she grabs a glob of clay and sits down on the rickety old chair. In almost a frenzied-like state she begins to shape the clay. She pounds, she rolls, she furiously punches the gray clay and finally a large round ball is formed and with anger she carves out the face; the eyes with tear drops spilling down the gray cheeks. She smashes the nose and reforms it much smaller. The down cast mouth speaks of great pain and sorrow. Poking and pulling on the clay she forms ears, then suddenly smashes them thinking they are too big. The clay face staring back at her is how she sees herself; lost, hopeless, no good, the lowest of lowest. She doesn’t hear the squeaky door slowly open and a Man steps inside. He stands in the doorway with the sun radiating behind Him watching her. The woman raises her fist and with a loud vehement cry she smashes her fist into the clay figure she has formed. He gently pushes her aside and takes the seat. 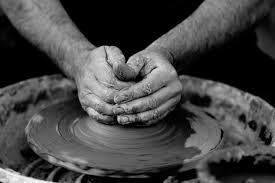 With hands of a Master He reforms the clay and in a short time the woman sees before her a new clay figure. The eyes are sparkling, the nose is pert with a smidgen of freckles, the mouth is full and smiling. Where there was a ghastly form of death, the clay figure is now filled with life. The Man scoots the chair back, stands, and smiles at her. Tears are running freely down her cheeks as she stares at the clay form. The Man reaches out and gently runs His thumb across her tears, wiping them from her cheeks. The woman throws herself into His arms and hugs Him tightly sobbing out all her hurt, all the pain life has thrown at her. His beard rubs her cheek and withdrawing from Him she places her hand on her cheek where His beard rubbed, savoring the lingering feeling. He smiles, then quietly slips out into the new day. Thank you Sue. God bless you my friend and sister. Happy Resurrection Day! Blessings to you Greg and thank you. Happy Resurrection Day to you, too. HE’S ALIVE Praise be to God. What a beautifully written post!!! Thank you so much Lydia. That’s very kind of you and thank you for stopping by my blog. Thank you Bill for stopping by. I appreciate your support. Blessings to you.